In presenting all three of Claudio Monteverdi’s surviving operas in close succession, the Boston Early Music Festival has given those lucky enough to secure tickets to the mostly sold-out shows a chance to hear top-notch performances of works that are thematically distinct from one another yet linked in a number of ways. After Sunday’s opening night of Il ritorno d’Ulisse in patria (The Return of Ulysses to his Homeland), a celebration of steadfast love and heroism based on the Homeric epic, L’incoronazione di Poppea (The Coronation of Poppea), heard Tuesday evening at the Boston University Theater, appeared to negate those precepts of constancy, rewarding blind ambition and unbridled lust. Viewed, however, as part of a “Venetian Trilogy,” postulated by Ellen Rosand in her book on Monteverdi’s late operas, this apparent apotheosis of corrupt behavior takes its place in a sequence of events leading from the defeat of the Trojans and the return of Ulysses to the downfall of the Roman republic and the foundation of the Republic of Venice. In between Ulisse and Poppea, another Venetian opera, Monteverdi’s Le nozze d’Enea e Lavinia (The Marriage of Aeneas and Lavinia), for which only the libretto based on Virgil’s Aeneid has survived, relates the founding of Rome. According to the founding myth promulgated in the trilogy, the new republic of Venice was the glorious successor to the pagan Roman republic. This back story would have been familiar to Venetian audiences of the mid-seventeenth century. Furthermore, the nature of Love—chaste, faithful, marital love or adulterous and sensual love, or reason vs. passion—was a favorite topic of debate at the Accademia degli Incogniti, a patrician male club that counted all three of Monteverdi’s Venetian librettists among its members. In contrast to Ulisse and Le nozze, both five-act classical “tragedies with a happy ending,” Poppea is a dramma musicale based on a free adaptation of Tacitus’s account of Roman history, along with other late Roman sources. 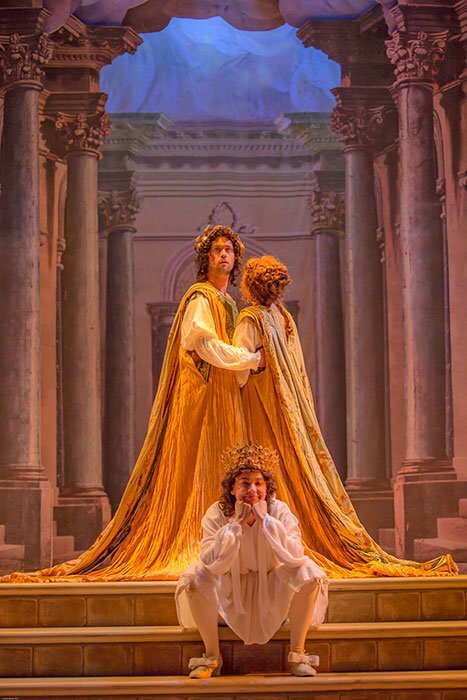 The libretto by Giovanni Francesco Busenello, in three acts, changes the actual sequence of historical events to arrive at a tightly structured drama with the death of Seneca as its central crux. Monteverdi in turn edited Busenello’s text as he saw fit, repeating words for emphasis and extracting entire lines to use as refrains in arioso or aria-like passages in the midst of declamatory recitative. The Prologue opened on the architectural portion of Gilbert Blin’s stage set. Draped in white, the figures of Fortune (soprano Erica Schuller) and Virtue (Danielle Reutter-Harrah) stood on pedestals like classical statues come to life as each proclaimed her superior power in extravagant coloratura. In the trouser role of Cupid, soprano Nell Snaidas appeared to declare Love’s victory over them both, to which Fortune and Virtue conceded in a beautifully executed duet in the form of a strophic love song, full of imitations and melting parallel thirds. Act I shifted the scene to Rome, represented by Corinthian columns in soft blues and reds in receding perspective. Costumes by Anna Watkins seemed to represent 17th-century historicized versions of Roman court dress: full-sleeved linen shirts, silk hose, and pumps, enhanced by brocaded Roman tunics and flowing cloaks for the men, sumptuous dresses for the women. Poppea’s lover Ottone returns at dawn, his happy expectation of a reunion with Poppea expressed lyrically in a lilting strophic aria in dance-like triple meter with interspersed instrumental ritornelli. As he becomes aware that Nero’s soldiers are on guard outside Poppea’s house, his song breaks off, shifting to a rhythmically and harmonically intense recitative as he inveighs against the wicked Poppea. Countertenor Nathan Medley made the most of this emotional shift, with beautifully modulated tone color and precise intonation. The two sleepy soldiers (tenors Aaron Sheehan and Zachary Wilder) injected a comic note with their increasingly frantic complaints in perfect ensemble. 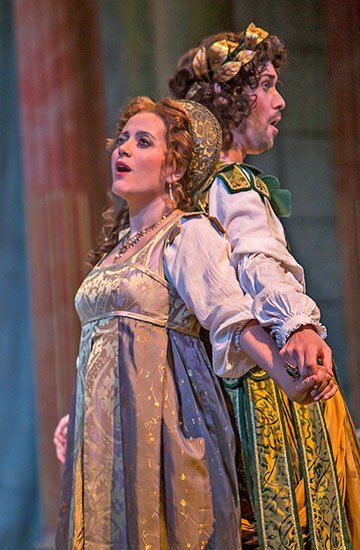 Nerone (countertenor David Hansen) and Poppea (Amanda Forsythe) showed their true colors in their first love scene: she insinuatingly seductive while demanding that Nero divorce Ottavia, he succumbing to her wiles with a sigh in the short aria “In un sospir.” In the following scene, Poppea flaunted her success in a triumphant aria “Speranza, tu mi vai/Il cor accarezzando” (O Hope, you caress my heart) ending in a refrain in “agitated” style that Monteverdi brought back no less than six times during the course of the scene: “Nò, non temo, nò, di noia alcuna” (No, no, I fear no adversity). Here early music favorite Amanda Forsythe showed off her brilliant singing technique as well as her ability to depict emotions from the softly seductive to excitedly shrill. In a traditionally comic role as the nurse Arnalta, mezzo Laura Pudwell pointed to the dangers of associating with kings in tones of high seriousness, only to insert with a wink “Ambitious vices are useless/I like constructive sins better.” A wonderful comic actress as well as a stylistically accomplished singer, Pudwell concluded the scene with a virtuosic tirade “Ben sei pazza” (You must be crazy). 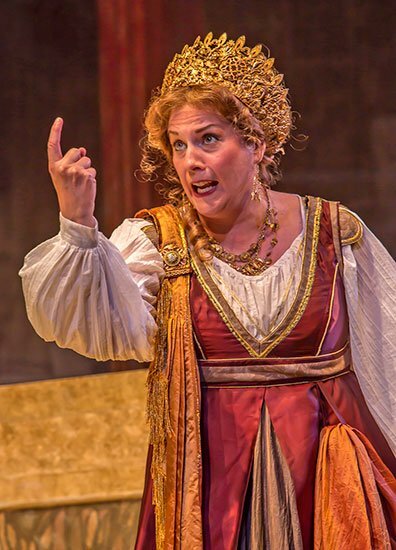 Ottavia’s great lament, in which she laments her rejection by Nero, is entirely in free recitative, and as such was a fine vehicle for Canadian soprano Shannon Mercer’s expressively powerful voice in a range of emotions from self pity to anger. Ottavia’s nurse, identified only as “Nutrice,” suggests she seek revenge by taking another lover. Comic female roles were frequently taken by cross-dressing males in Monteverdi’s day; countertenor José Lemos sang and played the role of the old woman to perfection. The philospher Seneca is introduced in four successive scenes. In the first, he preaches the virtue of constancy to Ottavia, who rejects his advice. Valletto, the page (another trouser role for the versatile Nell Snaidas), mocks the philospher as a fraud, what he sells as mysteries are mere ditties (this line sung over a short ostinato bass pattern). As Seneca, bass-baritone Christian Immler defined the role superbly, with a commanding stage presence, forthright tone, and amazing clarity of diction. Seneca maintains his calm stoicism as Athena announces his impending death and Nero announces his intention to banish Ottavia and marry Poppea. In the next scene, the seductive Poppea entices Nero into an agreement to do away with Seneca as well. Seneca’s death scene in Act II is unrelievedly poignant, as a bit of madrigalian fancy pictures a sigh from the heart ascending to heaven in a virtuosic flight. But even here there is a note of ambiguity, again in madrigal style: Seneca’s followers (tenors Aaron Sheehan and Zachary Wilder and baritone Marco Bussi) beg him not to die in rising chromatic harmonies, life is too sweet to be given up. The following two scenes contrast carefree and perverse love. The page (Nell Snaidas), feeling intensely but not knowing what it is that he feels, and the serving girl (Erica Schuller), leading him on, were a charming pair of virtuoso sopranos in a canzonetta-like aria over a lively repeated bass. The next scene showed Nerone celebrating Seneca’s death with his friend Lucano (tenor Zachary Wilder) as his compliant companion. Their song reaches its orgiastic climax in a celebration of Poppea’s beauty. Here the extraordinary range and expressive power of David Hansen’s voice, unusual in a countertenor, came to the fore. With no interruption for scene changes, which were mostly effected through changes in backdrop, the scenes of Ottone’s hesitant acceptance of Ottavia’s vengeful charge to kill Poppea, his approach to Drusilla (Teresa Wakim) who willingly lends him her clothes as a disguise, and the attempted murder in the garden, follow quickly. Laura Pudwell’s singing of Arnalta’s lullaby was one of the highlights of this beautifully directed scene. At the beginning of Act III, Drusilla is caught and exposed. She and Ottone both claim responsibility for the attempt on Poppea’s life, gaining in nobility as they do so. Teresa Wakim sang with power and conviction, and as Ottone, Nathan Medley rose to a new heroism. At the conclusion of the final coronation scene, the beautiful love duet, “Pur ti miro” (I gaze at you) brought down the house. Never mind that this last number is probably not by Monteverdi; there was more than enough to praise him for throughout the evening. And praise for all the singers, including those in the “minor” roles, uniformly excellent singers and actors with a sure sense of style; there were simply no weak links in the entire cast. The Festival Chamber Ensemble, led by concertmaster Robert Mealy, and the continuo group led by Paul O’Dette and Stephen Stubbs, provided harmonic support and tonal variety with their usual panache.